The homeowners of this seaside cottage felt that the existing spaces were too small and too separated from one another to suit their needs. They have a large extended family and wanted to be able to spend time together while on vacation. They desired larger, more open spaces with a kitchen prominent as the “heart” of the home. They did not want a dining table per se but requested casual seating at a bar located adjacent to the kitchen area and a large kitchen island for seating. 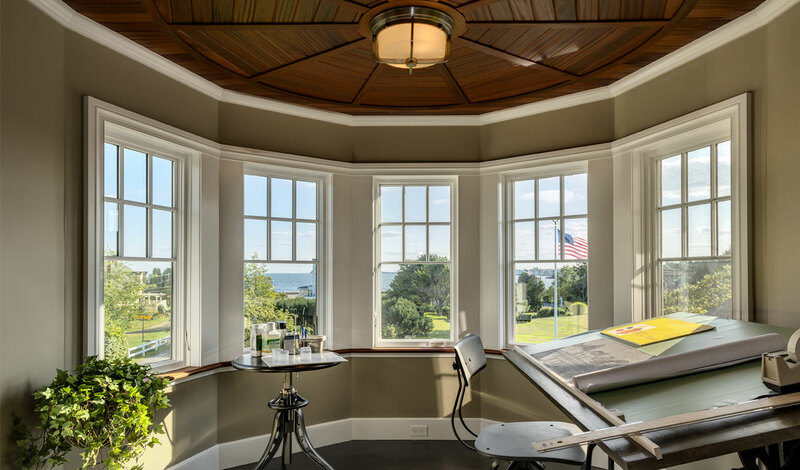 Because of its proximity to the ocean, a nautical motif runs throughout the home; the family room’s teak ceiling is reminiscent of the hull of a ship, a gold leaf weathervane in the shape of a ship graces the top of the stone turret and a marble compass rose in inlayed in the floor of the art studio. 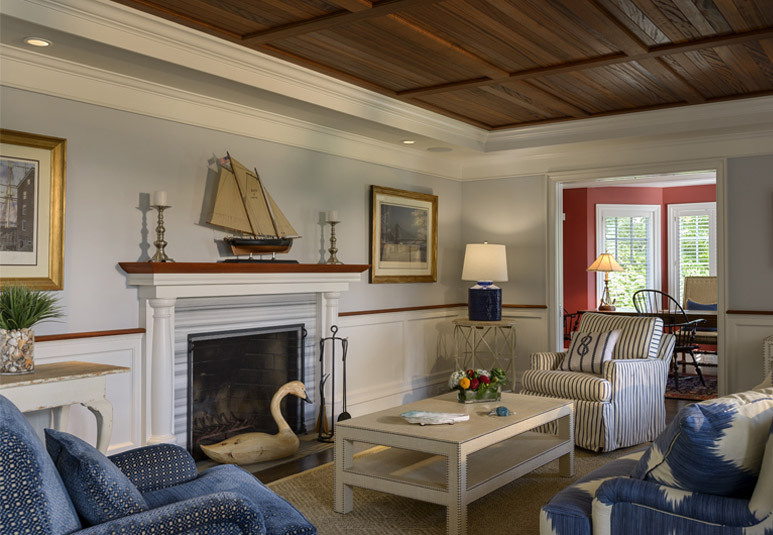 Blues of the sea and sky are used in the furnishings and paint colors. The original portion of the home was a small barn dating back to the 1890s. 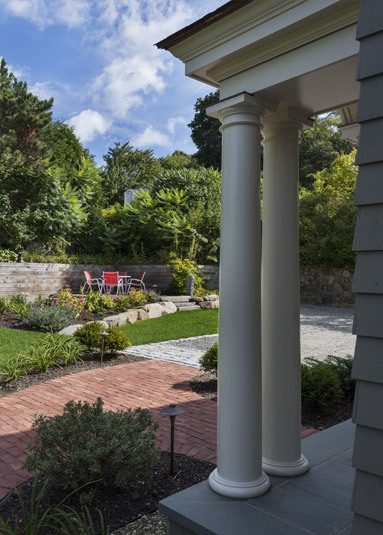 The home had been renovated and added on to several times over the past decades with very little over all planning or forethought. The existing spaces were too small and too separated for the current owners’ needs. 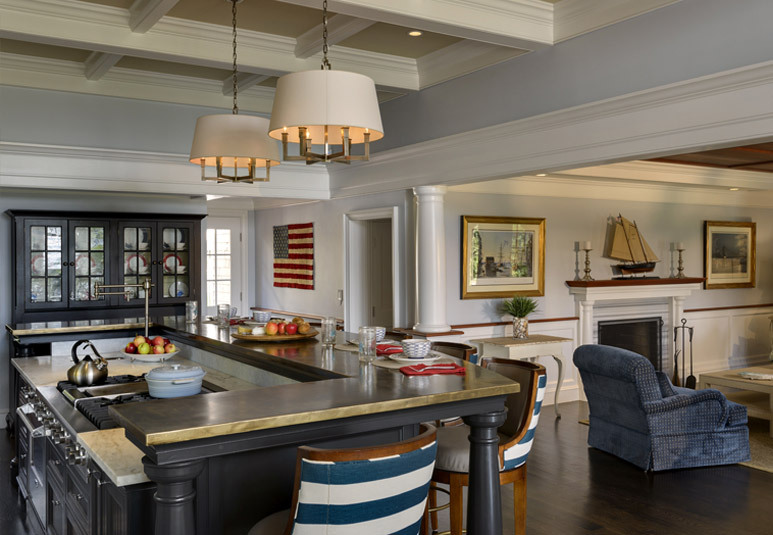 They have a large extended family, like to spend time together while on vacation and wanted to create larger, more open spaces with connectivity between the living spaces, kitchen and dining areas. The kitchen is the heart of this home and the family spends a great deal of time gathering in this space. They did not want any kind of dining table but rather requested casual seating at a bar located adjacent to the kitchen area and a large kitchen island for dining.